Graphic design is everywhere. Logos, magazines, animation, web pages, DVDs, video games – everything from gum wrappers to billboards – that’s graphic design. 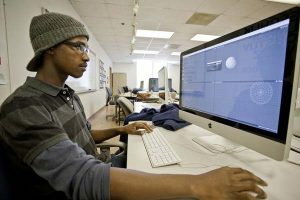 Planning, analyzing and creating visual solutions to communication problems are the heart of Tidewater Community College’s graphic design program. 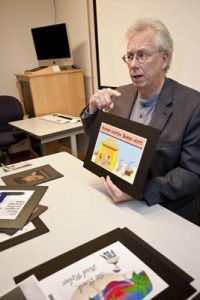 When professor of art Craig Nilsen started at the college in 1978, graphic designers relied on stencils and stat cameras. The field underwent an enormous evolution with the introduction of the personal computer in the mid 1980s, and the explosion of digital media and the Web has transformed the industry dramatically again. Students who complete the requirements for an Associate of Applied Science in Graphic Design are ready to meet the evolving demands of today’s changing climate. Students start with a foundations class – Art 131 Fundamentals of Design – that teaches the basics of line, shape, unity, harmony, value, texture and balance – all the compositional elements needed to create effective visual communication. All students learn the Adobe Creative Suite that has become so essential in today’s graphic design industry. Students leave the program well rounded and with a specialty, whether it be print, advertising or multimedia. The print program teaches students the essentials to create logos, magazine layouts and brochures. As part of Art 252, Communication Design II, students take over all the components in producing the student art publication “ Three Forty,” named for the address of the Visual Arts Center. The magazine showcases all the artwork produced by our students at the VAC. To create awareness for the magazine this year, students filmed a playful video that is featured on the VAC Facebook page. Students also take on projects with nonprofits, designing everything from business cards to billboards. “This gives them the real-world experience of working with a client,” Nilsen said. Advertising students take classes in marketing and copywriting, whereas multimedia students focus on taking visual information and presenting it digitally—including Web, video production and motion graphics. Real-world projects add to the learning process. Three state-of the-art Mac labs are available for students to use as are video production and sound recording facilities. Loaner video cameras and support light kits and sound recording equipment are also available. The main tools of the trade remain imaging and typography. Boone says graphic design is a great field for students with an interest in the visual world.